Hyatt Dulles Airport Hotel enjoys a privileged location next door to Washington Dulles International Airport. It's only 30 minutes from downtown Washington D.C. and four miles from Capitol Expo Center. Walking distance from shopping, restaurants and attractions, the Hyatt Dulles Airport Hotel provides convenience to travelers to Herndon, Virginia. Luxurious accommodations are offered to visitors at Hyatt Dulles Airport Hotel. Guest rooms and suites at the Hyatt Dulles Airport Hotel are all beautifully decorated and thoughtfully appointed. In-room amenities provided for hotel patrons at Hyatt Dulles Airport Hotel include, cable movie channels, coffee maker, hairdryer, and iron and ironing board. Northern Virginia's renowned seafood restaurant Snappers Seafood Grille is located right here at the Hyatt Dulles Airport Hotel. Express-O's located at Hyatt Dulles Airport Hotel's lobby area is ideal for hotel patrons to enjoy a cup of coffee or a specialty drink. 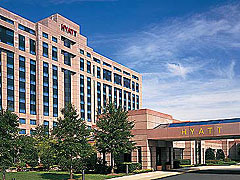 The Hyatt Dulles Airport Hotel offers business travelers outstanding conference and meeting facilities. Featuring 7256 square feet of function space including a ballroom, boardrooms and exhibition space, audio-visual services and banquet and catering services, Hyatt Dulles Airport Hotel ensures a successful event. Business Plan rooms are specially designed with mobile workers in mind and they are equipped with a personal work area and a computer hook-up. During their leisure hours guests can relax in the Hyatt Dulles Airport Hotel's indoor lap pool, whirlpool or sundeck. For a bit more action, hotel patrons can visit the Billiard room or exercise facility on site. Hyatt Dulles Airport Hotel is ideally located surrounded by many attractions including Wolf Trap Farm Park, Fair Oaks Mall, National Zoo, Mount Vernon and Reston Town Center. Enjoy fine dining and delicious drinks at the hotel's restaurant and bar. The hotel offers many thoughtful services to make every stay memorable. Relax and rejuvenate at the hotel's recreational facilities. Meeting and banquet facilities at this hotel are ideal for any corporate or social event. Herndon and the Washington DC area have many attractions to interest visitors.